Hon. Sheriff Oborevwori is the Speaker of the Delta State House of Assembly, a grassroot politician, in this interview with Gabriel Okoro spoke extensively on Delta State politics, the chances of Governor Ifeanyi Okowa returning to Government House in 2019 and other issues, excerpts. Q: How is Legislative Business in DTHA? Well, the Assembly is intact, we’re all on one page and we’re doing well. You know our major duty is to make laws and conduct our oversight functions. We are making our laws very well and performing our oversight functions. Q: Are there major bills pending before the House that could transform the lives of the people of Delta State? I don’t think there is a major bill pending right now but we’ve passed a major bill which Deltans applauded – the Deve Bill. You know,before now, if you want to carry out any development project, you see these youths coming around to extort money from contractors and developers. It was an Executive Bill and when it came, all of us came together, passed it, the governor assented to it and Deltans were very happy. It has reduced this issue of extorting money from developers. Even this morning, somebody sent me a text informing me that where they were carrying out a project that some youths were trying to extort money from them. I just told him to follow the process by reporting those people to the Police. As a legislature, we have done our own bit and it is the responsibility of the law enforcement agents to play their role. Q: Are there penalties for those who flout this law? There are a lot of penalties but I can’t give you details here. It’s not like before you just go and extort money from developers in the name of “deve” .There are a lot of penalties. Last week, we also passed two major bills namely the Public Finance Management Bill and the Audit Bill. Hopefully, very soon, we are also going to pass other bills which are currently pending at the Committee of the Whole. Similarly, we will also be considering the 2019 Appropriation Bill which we are likely to pass very soon. Q: The tenure of the Assembly would soon elapse ; as the Speaker, what legacy would you be leaving behind at the end? Well, for the first time, members and the Speaker are on the same page. Recently, the staff of the Assembly celebrated me because we ensured that their wardrobe allowance was paid, some arrears were paid and these allowances have become steady. So they are happy because of improved welfare for these workers. I can tell you that this is a very good legacy because before now, they used to protest and embark on strike for these things. But when I came in, I met with the governor and tabled the issue before him. He gave approval for the allowances to be paid and since then it has been regular. On January 23 when we resumed this year, for the first time in the history of the Delta State House of Assembly, my colleagues and I were celebrated by these workers. Q: Your former governor and boss, Dr Emmanuel Uduaghan has defected from the PDP to APC. What does this mean to the politics of Delta State? Well, for somebody who had served the People’s Democratic Party (PDP) for over sixteen year… Commissioner for four years; Secretary to the State Government for four years and a Governor for eight years…. I don’t know how he will stand on the podium to campaign against the party he has been a member all these years. I normally would not want to comment on it because those involved in this matter are my bosses. He and the current governor are still in good terms. Our national leader too, they are all working together. I don’t think that there is any cause for alarm. Q: You mean there is no cause for alarm when one of your key politicians is on the other side? He’ll come back. I have told people before, he will come back because he will even be missing his political family. That place is not his family, so he will return back. The governorship candidate of the APC in the state, Chief Great Ogboru is somebody who fought him for those eight years. He went to court for over ten times. So I don’t know the kind of friendship they will have now just because of politics. You know normally we agree and disagree in politics but I don’t think there is no cause for alarm. He went there on leave and he will come back. Q: Some people have said that the Okowa administration has performed below expectation Don’t you think that the APC might have a chance in the next election in Delta State? Governor Ifeanyi Okowa has done very well. I think that anyone saying otherwise is just doing propaganda. The man has worked brilliantly well. As you can see, there is peace across the state, there are no incidents of pipeline vandalism. There is no ethnic crisis. There is peace and there is development. He has gone to nearly all the Local Government Areas to hold Town Hall Meetings. This has never happened in the history of Delta State. You cannot go and hold Town Hall Meetings where you don’t have things on the ground. As he goes to those Local Governments, he goes there to inspect and commission projects. Usually the first day is for inspection and commissioning of projects while the second day is for the Town Hall Meeting where he comes before the people to ask: What are your issues? If what he has done is not enough and like Oliver Twist, you people need more, you ask him and he will still do. He would want to know what you actually need on a scale of preference in your place. But you cannot say that there is no development going on. Let somebody come out and say there is one Local Government which the governor has not touched and commissioned projects in Delta State. Q: From the way you’ve spoken so far, it appears you are enjoying a very cordial relationship with your governor? You see, let me tell you, the legislature must be on the same page with the executive arm of government especially when the executive is doing well. We don’t want the kind of situation at the National Assembly where there us no cordial relationship between them and the executive. You can see that there are a lot of issues out there. In our own case, we’re on the same page; we work together and that is why there is peace in Delta State. That’s what we are doing. Our relationship with the executive does not affect our oversight functions. Q: There’s a common complaint that state legislatures are in the pockets of the governors. Is that the case in Delta State? If you know Governor Ifeanyi Okowa, he’s a fine gentleman and an administrator. This is someone who has been to the Senate and knows the roles of the legislature. So he accords us our respect and we also accord him his own respect. We work together; he has never interfered in our oversight functions. So things are going very well. Q: Do you have any fears that the All Progressives Congress (APC) might spring a surprise against the PDP in the state next year? I don’t think the APC has that capability to win elections in Delta State. Let me tell you how Delta State works. Even though it is not a written agreement, there is a rotational principle in place for the governorship of the state. In Delta Central, we have taken our share of ten years. Olorogun Felix Ibru did two years and Chief James Ibori had eight years. Delta South has also done their iwn eight years through Dr Emnanuel Uduaghan and now it is the turn of Delta North. 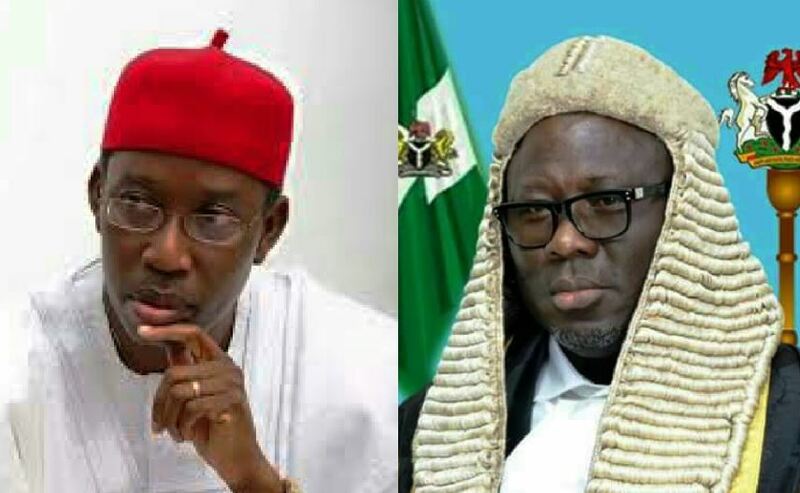 The incumbent governor, Dr Ifeanyi Okowa is just about to complete the first four years and for the sake of equity, justice and fair play, it is good that Delta North should have their eight years. This is my personal opinion. Why we in Delta Central want to support Delta North on this matter so that when it comes to the turn of Delta Central in 2023, they will also join hands to fight and ensure we get it. If we fight Delta North now, you will be surprised that in 2023, they can join hands with Delta South to produce a Governor from the South. So a very sensible person from Delta Central knows that for equity, Delta North should have their own fair share of eight years. Q: But this rotational principle is a PDP arrangement which the APC might not want to respect? Listen, we’re all Deltans. In the last election, all the people that voted for Okowa in Delta North were not only members of the PDP; even the opposition voted for him. So, I will tell you that it will be difficult for any person from Delta North to fight when they know that it is good for them to have him as the governor. They will vote, they will not fight him. So he will sweep the whole of Delta North; he will come and share in the votes of Delta Central and he will win Delta South because the Deputy Governor is from there. In 2015, he won when he had not done anything. Why do you think he will not win now when he has executed several projects? When it comes to human capital development and infrastructure, he has done very well.I see no reason why he will not just win but win overwhelmingly. Q: Many states governed by the main opposition party, PDP are afraid of what might happen in 2019 given the trends in recent elections in Ekiti and Osun States. Do you have such fears about the so called federal might? There’s no fear. You can only fear federal might when you are not popular in your state. When you’re popular they cannot manipulate the election because it is people that they use. Let me give you an example with my village; if you like bring armoured tank, even if I am not there, we will deliver. So there’s no fear. But I want to tell you one thing, power belongs to God, not man. When God says it’s your turn, there’s nothing any man can do. God has blessed the state and the Governor is a God fearing person. He believes in God. When you ‘re with God, you are majority. So, I don’t think we have any fear. Q: After all said and done what do you see playing out in the next election? It’s not about me, it’s about what Deltans want. By the grace of God, Okowa will be re-elected. Like I said, power belongs to God and I believe that Deltans are wise enough. The devil you know is better than the angel you don’t know. They’ve known Okowa and come 2019, they will return him. Q: Are you likely to return to your present seat? I am not even talking about that because position is given by God. I am not talking about that because when you do well, it is your colleagues that will look for you. They will say: Come, we want you again. So it’s not man; it’s God. I was not elected as a Speaker. I was only elected to represent my constituency.